It was 1935 when Con Conrad and and Herb Magidson took home the first-ever Oscar for Best Original Song: “The Continental,” from the Fred Astraire and Ginger Rogers musical The Gay Divorcee. Since then, the winners have expanded from big-band dance number centerpieces to include stirring pop epics from animated movies, non-diagetic love ballads from blockbuster romances, and character themes from all sorts of genres — rock, folk, country, funk and, in the 21st century, even hip-hop. The list of the songs that have won Best Original Song is a bizarre one. It encompasses classic rock legends like Bob Dylan and Bruce Springsteen, Great American Songbook crafters like Irving Berlin and Burt Bacharach… and also Christopher Cross, Bret from Flight of the Conchords, and three seperate songs sung by Jennifer Warnes. Timeless classic films like The Wizard of Oz, High Noon, and Breakfast at Tiffany’s are represented… as are A Hole in the Head, Waikiki Wedding, Thank God It’s Friday, and some movie called Frozen. Put this playlist on shuffle and you’ll be hospitalized for whiplash within six songs. We’ve trudged through the gems and the duds, the songs that have become part of cinema history and the songs whose writers have even forgotten about, to rank the winners from worst to first — also taking a moment to point out the notable nominees beaten each year, and those snubbed from being nominated in the first place, whether due to arcane Academy rules or sheer neglect. 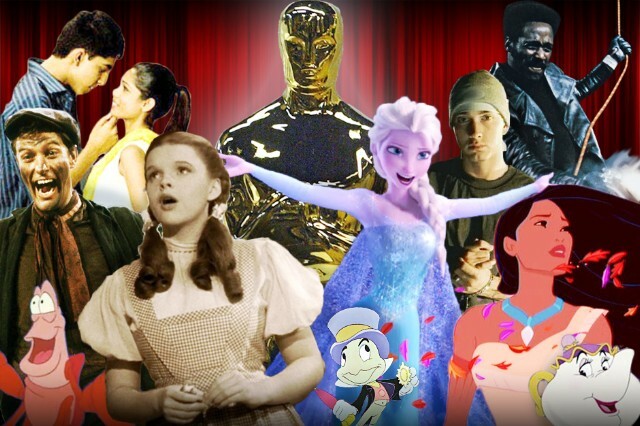 Be warned that we ranked the songs according to the versions used in their Oscar-winning parent movies, which aren’t necessarily the most famous version of the song — so it’s Terence Howard and Taraji P. Henson doing “It’s Hard Out Here For a Pimp,” not Three 6 Mafia, and Angela Lansbury singing “Beauty and the Beast,” not Celine Dion and Peabo Bryson. See where your favorites ranked below — unless your favorite is Phil Collins’ Tarzan song, in which case maybe don’t — and check back next week to see where this year’s winner ends up falling. Snubbed: Nothing from Curtis Mayfield’s iconic Super Fly soundtrack to be found — probably a counter-balance to Isaac Hayes winning the year before, lest the Academy start to reach a level of cool that would have been totally unsustainable. Speaking of South Park, the movie’s amazing assault on our neighbors to the north, “Blame Canada,” got screwed out of an Oscar by Phil Colins’ mewling sapfest. While some of the soft-rock icon’s contributions to Tarzan are fun in a cornball kind of way, “You’ll Be in My Heart” is an overwrought bore. J.G. Also Nominated From ’99: “Canada” wasn’t the only gem passed over in the name of Phil: Aimee Mann’s “Save Me” from Magnolia, an Oscar nominee of rare subtlety and vulnerability, was also overlooked. Snubbed: R.E.M.’s “Man on the Moon,” the Automatic for the People single that inspired the Andy Kaufman biopic of the same name, was naturally ineligible, but the fair-game “The Great Beyond” — one of the band’s last great singles, and their biggest-ever hit in the U.K. — was also ignored, along with star Jim Carrey, and the rest of the Milos Forman-directed movie. After failing to win at the ’95 and ’99 awards for his first two Toy Story numbers, Randy Newman finally won in 2010 for easily the worst of the bunch: “We Belong Together,” another trite and predictable ode to lifelong companionship that only serves as slightly less self-parodic than “Left Foot, Right Foot.” A.U. Also Nominated From ’10: Nothing you’ve thought about since 2010, unless you were a weirdly big Country Strong fan. Snubbed: All of Cher and Christina Aguilera’s Burlesque songs, including the Golden Globe-winning “You Haven’t Seen the Last of Me,” as well as Pharrell’s work for the first Despicable Me soundtrack and Justin Bieber and Jaden Smith’s Karate Kid theme, “Never Say Never.” Slim pickings for sure, but more relevant than most of the songs that made the cut, at least. Also Nominated From ’51: The lovely quasi-standard “A Kiss to Build a Dream On,” recorded first by Louis Armstrong for the Mickey Rooney musical melodrama The Strip. Snubbed: The Burton Lane / Alan Jay Lerner composition “You’re All the World to Me” might not have been a classic, but it definitely at least soundtracked a classic movie scene — Fred Astaire’s famous spinning-room dance sequence from Royal Wedding, later referenced in countless music videos. Takes a while to get going, and while it builds competently — with one voice becoming two, then dozens alongside increasing instrumentation — it’s not that impressive outside of the context of the movie, especially for a song that combines the talents of two of the greatest pop stars of the 20th century. It’s also a little preachy, although that’s kind of a given. J.G. Also Nominated From ’98: “I Don’t Want to Miss a Thing,” histrionic Diane Warren power ballad and first-ever Hot 100-crowner for rock legends Aerosmith, from Michael Bay’s apocalyptic blockbuster, Armageddon. Snubbed: The only other power ballad that might have been as ubiquitous in 1998 as Aerosmith’s, the Goo Goo Dolls’ City of Angels contribution “Iris.” Also, don’t forget that Aaliyah’s “Are You That Somebody?,” one of Baby Girl’s signature hits and on the shortlist for Best R&B songs of the decade, was first heard on the Dr. Doolittle 2 soundtrack that year. A legendarily insipid ballad, which somehow topped the Hot 100 for a then-record ten straight weeks and won the Oscar in one of the all-time great years for original film songs. This isn’t even the famous version, either: It’s Did Cohn lip-syncing along Kacey Cisyk. God must have been piiiiiisssssed at this being done in his name. A.U. Also Nominated From ’77: The Carly Simon-sung, Marvin Hamlisch and Carol Bayer Sager-penned “Nobody Does It Better,” from The Spy Who Loved Me — a No. 2 hit and one of the all-time great Bond themes. Snubbed: Oh nothing much, just every song eligible from the Saturday Night Fever soundtrack, which spawned four undying No. 1 hits and sold 15 million copies in this country alone. “Theme From ‘New York, New York,” too. Thank the Lord that they remembered that timeless chestnut “The Slipper and the Rose Waltz (He Danced With Me/She Danced With Me)” from The Slipper and the Rose, though! “Mona Lisa” deservedly became a standard in the capable hands of Nat King Cole. Unfortunately, the version from Captain Carey was performed by the significantly less-enduring Charlie Spivak and Tommy Lynn: a limp, repetitive arrangement that has deservedly been lost to the ages. A.U. Also Nominated From ’50: “Bibbidi-Bobbidi-Boo” from Cinderella, one of Disney’s all-time great nonsense jams. Snubbed: “Silver Bells,” a future holidays perennial, actually debuted in ’50 in the Bob Hope and Marilyn Maxwell comedy The Lemon Drop Kid, which is definitely the only reason anyone would have cause to discuss The Lemon Drop Kid in the year 2015. In one of the all-time years for blockbuster film themes — the 1984 ceremonies were the first and to-date only time when all five Best Original Song nominees were No. 1 hits — the award went to a creative nadir for the great Stevie Wonder, a perfectly nice song that was nevertheless a totally fair target for Jack Black’s eventual dickish scorn. A.U. Snubbed: …the Academy somehow whiffed on including anything from the biggest soundtrack of the whole decade, Prince’s Purple Rain. The Purple One did take home a statue in the now-defunct Best Original Song Score category, but no song from the movie — which included a couple chart-toppers of its own in “Let’s Go Crazy” and “When Doves Cry,” not to mention the No. 2-peaking title track — even got nominated. How do you sleep at night, Loggins? The list of great songs about the indomitable spirit of large, open-range felines is not a long one, though Matt Monro’s hilariously melodramatic title song for Born Free certainly does its damnedest to get on there. The earned grandiosity of The Lion King’s “Circle of Life” three decades later effectively made this song totally useless. A.U. Also Nominated From ’66: A couple of memorable British themes: Cilla Black’s Burt Bacharach / Hal David-penned title track to the Michael Caine vehicle Alfie, and the Seekers’ vivacious hit ode to the protagonist of Georgy Girl. Snubbed: Did you know that the original version of “Strangers in the Night” was an instrumental recorded by easy-listening maestro Bert Kaempfert for the movie A Man Could Get Killed in 1966? Well, neither did the Academy. Middling, self-congratulatory theatrical fare. Far more memorable for its ahead-of-its-time cinematic introduction — performed in a two-minute one-shot zoom-in on performer Wini Shaw that looks like something from Eraserhead, courtesy of famed choreographer Busby Berkeley — than for anything related to the song itself. A.U. Also Nominated From ’35: The considerably fonder-remembered Irving Berlin composition “Cheek to Cheek,” introduced by Fred Astaire in Top Hat. Snubbed: “You Are My Lucky Star,” from the confusingly titled Broadway Melody of 1936. In that movie, the song was by cast member Frances Langford and others, but it’s probably best-remembered today as being sung by a terrified Sigourney Weaver in the final fight scene at the end of Alien. It’s unfortunate that Melissa Etheridge’s well-intentioned climate-change ballad sounds like it could be the background music to any generic television PSA. The “wake up” metaphor is a cliché, and the country twang is pretty uninspired, making the mostly toothless call-to-action seem preachy and hokey. Climate change is real, but this isn’t the most motivating of protest songs. J.G. Also Nominated From ’06: “Listen,” Beyoncé’s powerhouse ballad from the climax of Dreamgirls. Snubbed: Cobra Starship’s “Snakes on a Plane (Bring It! ),” the best ’80s blockbuster theme of 2006. A very short, very slight, and probably somewhat culturally patronizing Bing ballad. Those high notes are pretty chill, though. A.U. Also Nominated From ’37: Another Fred Astaire classic in the George and Ira Gershwin-scribed “They Can’t Take That Away From Me,” from Shall We Dance. And “That Old Feeling,” from Vogues of 1937, was big enough that it was still inspiring movie titles 60 years later. Snubbed: Geez, Snow White and the Seven Dwarfs, anyone? “Whistle While You Work,” “Heigh-Ho,” “Some Day My Prince Will Come” — all given the cold shoulder, though the movie did get a nomination for its influential score, and an Academy Honorary Award for Walt Disney, basically just for making a badass movie that everyone loved. Snubbed: Sadly, the hypnotic “Once Upon a Dream” from Sleeping Beauty — covered last year by Lana Del Rey for Maleficent — was ineligible, due to being largely derived from Tchaikovsky’s ballet of the same name. When Andrew Lloyd Webber and Tim Rice write a song, at its worst it feels like a single they never convinced Celine Dion to sing, and at its best it combines pop’s eagerness to please with Broadway’s hunger for human emotion and struggle through song. “You Must Love Me” is the song they wrote especially for their film adaptation of the Evita musical, and it’s far more the former than the latter: The show clips along with songs both catchy and narratively prurient, yet “You Must Love Me” feels like a pause rather than propulsion. D.L. Also Nominated From ’96: Amazingly, the Beatlesque theme to the ’90s cable favorite That Thing You Do! — written by Fountains of Wayne’s Adam Schlesinger — was actually recognized this year, even if it had no chance of finishing better than a distant third to Evita and Celine Dion’s Diane Warren-penned “Because You Loved Me,” nominated from the Robert Redford and Michelle Pfeifer workplace romance Up Close and Personal. Snubbed: R. Kelly’s “I Believe I Can Fly,” a ballad whose gospel was powerful enough to reduce the Notorious B.I.G. to tears, was cruelly rebuffed, presumably because it soundtracked a movie where Michael Jordan played a bunch of cartoon monsters for the fate of the Looneyverse. Not even Judy Garland’s best movie song about public transportation. A.U. Also Nominated From ’46: “I Can’t Begin to Tell You,” sung by John Payne in The Dolly Sisters, and an eventual No. 1 hit for Bing Crosby. Snubbed: Rita Hayworth acolytes in the ’40s were no doubt smarting at the exclusion of “Put the Blame on Mame,” dubbed by Anita Kert Ellis for Hayworth’s title character in the iconic noir Gilda. A Bond theme for and by people that don’t really get what makes a great Bond theme — foreboding, dramatic, and sweeping, but critically lacking in momentum, absurdity, and fun. A.U. Snubbed: Whether you liked it or not, it was pretty inarguable that the biggest song from a movie in 2015 was Wiz Khalifa and Charlie Puth’s 12-week chart-topper “See You Again,” from Furious 7. And though it certainly wasn’t technically eligible, it was stark how superior Radiohead’s rejected Spectre theme was to Sam Smith’s statue-winning take. A soft-rock megahit, and Babs’ only Oscar-winning song that she actually received a statue for (co-)writing. Nobody makes melodrama as familiar and comforting as Streisand, but “Evergreen” is sorely lacking in the pathos of “The Way We Were” or even the humanity of “Funny Girl.” A.U. Also Nominated From ’76: Bill Conti’s pump-up perennial “Gonna Fly Now,” a chart-topping quasi-instrumental from the Rocky soundtrack, which has soundtracked about a billion more training montages than Babs’ whole catalog combined. Snubbed: The entirety of Rose Royce’s supremely funky Car Wash soundtrack, including the group’s two biggest smashes: the sultry ballad “I Wanna Get Next to You” and the clap-happy title track. “Something He Can Feel,” a crossover hit for Aretha Franklin (and later En Vogue) off the Sparkle soundtrack was also ignored. Points for the super-cold Philly-Soul strings and drums, for its association with the Ben Hur of ’70s disaster pics, and for simply not being “The Morning After.” Otherwise… eh. A.U. Also Nominated From ’74: Western balladeer Frankie Laine’s straight-faced rendition of Mel Brooks’ title theme to Blazing Saddles. Snubbed: Legendary Motown writer/producer’s Willie Hutch’s work on the Foxy Brown soundtrack, particularly the title theme (“No, but please don’t make Foxy mad / Or you’ll find out that the lady is superbad”). The chorus is probably Lionel’s dumbest, the verses are even worse (“I had a dream / I had an awesome dream”), and the song is tissue-flimsy enough to make Phil Collins sound like Phil Lynott by comparison. But the airy synths are pretty irresistible, and when those huge ’80s drums kick in, the hands go up in the air reflexively. A.U. Also Nominated From ’85: Huey Lewis & the News’ universally beloved Back to the Future theme, “The Power of Love,” a song that would get you reported as a communist collaborator for hating on back in ’85. Snubbed: The biggest snub was probably Simple Minds’ “Don’t You (Forget About Me),” a new-wave totem and generational anthem by virtue of its association with The Breakfast Club. But there were a whole host of ’85 misses, including the best Bond theme in a decade (Duran Duran’s “A View to a Kill”), James Brown’s all-time biggest pop hit (“Living in America,” from Rocky IV), and Madonna’s first two soundtrack gems (“Crazy for You” from Vision Quest and “Into the Groove” from Desperately Seeking Susan). Also Nominated from ’14: The Lonely Island and Tegan & Sara’s “Everything Is Awesome,” the delirious and hilariously over-caffeinated faux pop megahit from the universe of The Lego Movie, as well as the Adam Levine solo soul-pop ballad “Lost Stars,” co-written by the inimitable Gregg Alexander. Snubbed: “Boom Clap,” Charli XCX’s euphoric breakout solo hit from the Fault in Our Stars soundtrack. In its Johnny Mandel and choir incarnation, “Shadow” was hardly the most striking of movie themes, but short and sweet and maybe even the slightest bit sinister. Also a Grammy winner for Song of the Year (as performed by Tony Bennett), beating out the most covered song of the 20th century. A.U. Snubbed: Speaking of Jones, he pulled double film duty in ’65, also singing the title song to Thunderball, a supremely underrated Bond movie and theme. A somewhat frivolous song contingent on understanding plot points from the film of the same name (or the Roman tradition it’s based on), though it improbably became something of a go-to and trademark number for Ol’ Blue Eyes just the same. A.U. Also Nominated From ’54: “The Man Who Got Away,” Judy Garland’s big number from the Mk. II film version of A Star Is Born. Snubbed: Nothing terribly notable — Frank Sinatra’s title theme to “Young At Heart” was released before the movie, and nothing from Carmen Jones (originally a stage musical from a decade earlier) was even close to eligible. So What Happened to A Star Is Born?